Africa’s diverse cultural heritage and dignity is uniquely celebrated by the work and life-long commitment of artist and global Ndebele cultural icon, Dr Esther Mahlangu. In South Africa we embrace her as a national treasure, a wise elder and passionate, committed ambassador for contemporary art and culture from the continent. The artist has been painting for over half a century and has captivated the interest and imagination of the world with her talent for reimagining isiNdebele cultural expression, and her beautiful understanding of how art is central to not only our cultural identity but also our humanity. Not only does she still paint and travel, she also teaches at and runs the art school she founded for young people in her region. Even at the age of eighty three the iconic contemporary artist still produces work prolifically, reimagining the traditional patterns and ancient sacred geometry of the isiNdebele culture. Nothing makes the artist more happy than painting and continually evolving her practice – that and being able to share her culture with the world. Dr. Esther Mahlangu’s access to global platforms over decades has impacted on the artist positively, and so too her clear understanding of Africa and its place in the international art world. In February Dr. Mahlangu will be visiting Cape Town for a series of events celebrating her life and work. She is currently producing new work and will unveil six new paintings she has created for the One&Only Resort to commemorate the official opening of the Melrose Gallery, Cape Town. The unveiling of these distinct new pieces of work by the artist during her visit is the highlight of the official opening event of the new gallery. The Melrose Gallery has entered into a partnership with the One&Only Cape Town and the artist’s works will be unveiled and proudly displayed in the main foyer as a symbol of national pride and heritage. 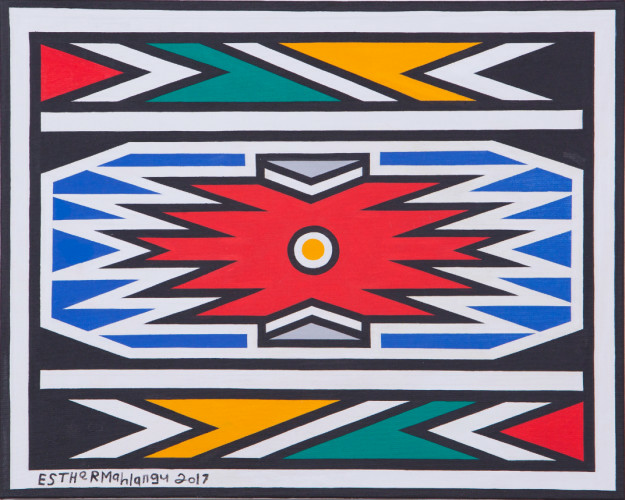 The gallery has a long association with Dr. Esther Mahlangu through its representation of her work and enabling her to engage platforms via her art and cultural activism around the world. The artist will also be present for the opening of her solo exhibition with the Melrose Gallery at the Investec Cape Town International Art Fair, CTAF 2019 from 15-17th February. The Melrose Gallery, Dr. Esther Mahlangu’s gallerist, is proud to be showing her new body of work at CTAF. The gallery will host a commemorative event in honour of Dr. Mahlangu, and her official appointment as ‘Officer of Arts and Letters’ by the French Government when she receives the Légion d'Honneur – France’s highest decoration for excellence in the arts during this same period.